Begin by placing the center of your CLX in a CLX door anchor at floor level. 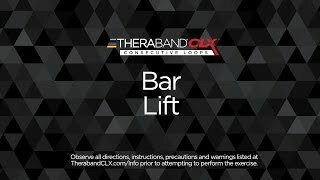 Place your bar into the end loops of the CLX. Holding the ends of the bar with the CLX ends inside your hand grip, use straight arms to lift the bar diagonally over your head. Hold briefly and repeat on both sides. Tip: Be sure to keep your torso facing forward.